« Deal Of The Week? Google has replaced the search engine’s logo with a painting in his honor. The still-life painting is front and center on the Google homepage. The Google Paul Cézanne Doodle was done in his style and represents some of his most famous works of art. The tribute has been done to mark Cezanne’s 172nd birthday. Go to Google and click on the Google Paul Cézanne Doodle to learn more about the artist. 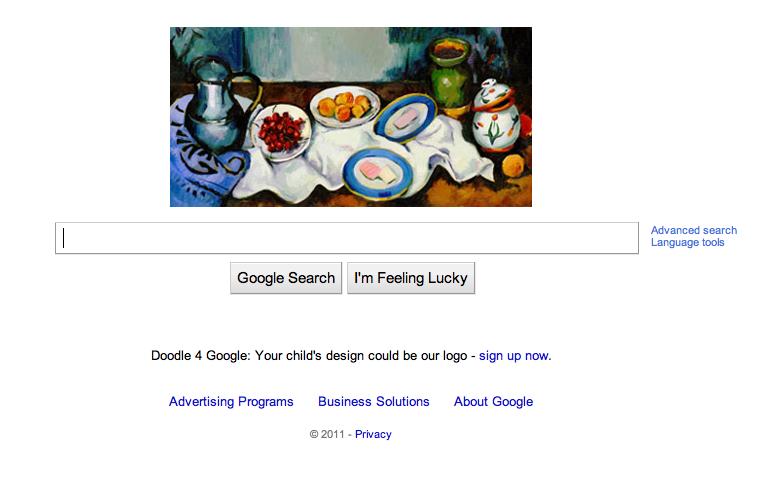 This entry was posted on January 19, 2011 at 9:03 am and is filed under Paul Cézanne Google 2010 Doodle. You can follow any responses to this entry through the RSS 2.0 feed. You can leave a response, or trackback from your own site.